Protect your appliances and plumbing by reducing the adverse effects of corrosion and scale (calcium, barium and magnesium buildup) with the Aquasana SimplySoft Salt-Free Water Softener. Conditioned water extends the life of your plumbing and appliances and can even help reduce existing buildup, prolonging the life of your home assets. Be free of filmy residue and spots on laundry, dishes and glassware. Reducing the effects of hard minerals in water helps eliminate spotting and film residue from dishwasher and washing machine cycles, protecting your clothing and tableware. 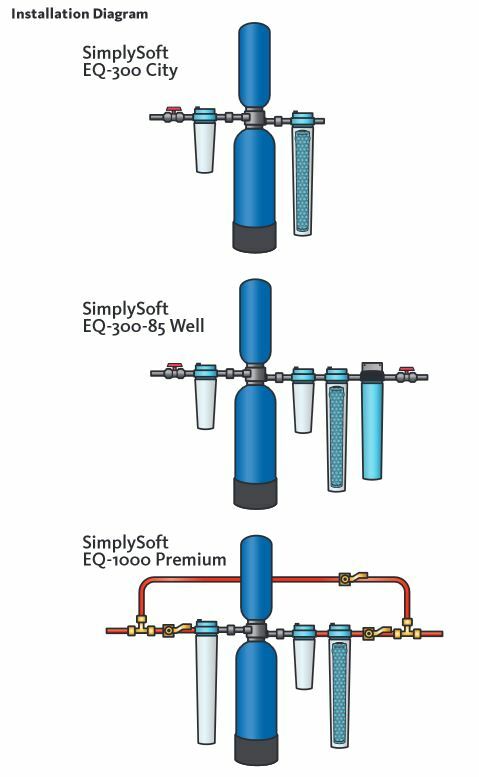 The SimplySoft can be easily added to any existing EQ Rhino system or any whole house water filtration system or it can be easily installed with your new Rhino whole house System. Simply add the SimplySoft salt-free water softener to your cart to include it with your EQ Rhino whole house package. More than just a softener, Aquasana SimplySoft uses innovative SLOW PHOS salt-free water softening technology to naturally condition your water and protect your pipes from corrosion without the use of added sodium. As its name implies, SLOW PHOS uses food grade polyphosphate beads engineered to dissolve at a controlled (or "slow") concentration to effectively target scale producing hard mineral carbonate crystals including calcium, magnesium, and barium (Ca, Mg, and Ba). SLOW PHOS technology works by altering the ionic charge of these carbonate crystals to reduce their attraction to one another in your water. By altering their ionic charge, hard minerals will no longer clump or pack together and create scale (Ca, Mg, and Ba buildup). In addition, SLOW PHOS phosphates act as a protective barrier in your plumbing to protect from pipe corrosion. Unlike salt-based water softeners, Aquasana SimplySoft SLOW PHOS technology will not demineralize your water nor will it negatively affect the environment by adding excessive amounts of sodium into our communal water system. 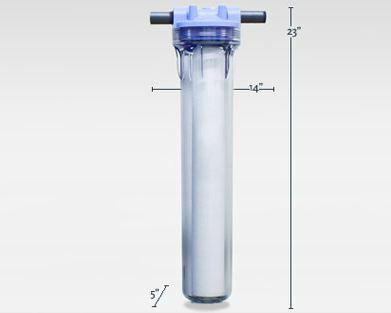 The Aquasana SimplySoft Salt-Free Water Softener employs NSF certified SLOW PHOS slowly-soluble polyphosphate beads engineered to prevent scale formation and corrosion by altering the charge of hard mineral ions including calcium, magnesium, and barium. This process allows beneficial minerals to remain in your water and eliminates the negative impact of salt waste on the environment. The Aquasana SimplySoft Salt-Free Water Softener uses innovative SLOW PHOS salt-free water softening technology to naturally condition your water without the use of added sodium. Common salt-based water softeners demineralize water by replacing natural, healthy minerals with sodium (salt) ions, which can be harmful to consume. Aquasana SimplySoft uses innovative SLOW PHOS salt-free water softening technology to naturally condition your water without the use of added sodium. The World Health Organization (WHO) recently released a study on drinking water reporting sufficient evidence that there are various health risks associated with drinking demineralized water. Due to the detrimental effects salt-based softeners have on the environment, many states and counties have actually banned the use of salt-based water softeners. Salt-based water softeners that use a process of ion exchange require a large amount of highly concentrated salt solution to replace the natural minerals in your water with sodium. This process results in waste water discharge that is harmful to the environment and reduces the reusability of treated wastewater. The SimplySoft Water Softener system is easy to install with the help of a licensed plumber and requires no electricity or back-flushing. The SimplySoft can be installed as a stand alone water softener, to an existing whole house water filtration system or it easily install with our Rhino Whole House Systems or where your water line enters your home before the hot and cold split. This system can be installed inside or outside your home as long as it is protected from extreme temperatures, freezing temperatures or direct sunlight. The SimplySoft Water Softener System comes with everything you need for installation and system maintenance is easy. The Aquasana SimplySoft Water Softener can easily be replaced without the need for a plumber. Q. Is the SimplySoft also a filter? No, the Aquasana SimplySoft is not a filter. It does not filter out chemicals, VOC's, or chlorine. However, it's also more than just a softener. Aquasana SimplySoft uses innovative SLOW PHOS salt-free water softening technology to naturally condition your water and protect your pipes from corrosion without the use of added sodium. As its name implies, SLOW PHOS uses food grade polyphosphate beads engineered to dissolve at a controlled (or "slow") concentration to effectively target scale producing hard mineral carbonate crystals including calcium, magnesium, and barium (Ca, Mg, and Ba). SLOW PHOS technology works by altering the ionic charge of these carbonate crystals to reduce their attraction to one another in your water. By altering their ionic charge, hard minerals will no longer clump or pack together and create scale (Ca, Mg, and Ba buildup). In addition, SLOW PHOS phosphates act as a protective barrier in your plumbing to protect from pipe corrosion. Unlike salt-based water softeners, Aquasana SimplySoft SLOW PHOS technology will not demineralize your water nor will it negatively affect the environment by adding excessive amounts of sodium into our communal water system. Q. What makes SimplySoft different from other water softeners? Common salt-based water softeners demineralize water by replacing natural, healthy minerals with sodium (salt) ions, which can be harmful to consume. Aquasana SimplySoft uses innovative SLOW PHOS salt-free water softening technology to naturally condition your water without the use of added sodium. The World Health Organization (WHO) released a study on drinking water reporting sufficient evidence that there are various health risks associated with drinking demineralized water. Q. What replacement parts or maintenance is needed for the SimplySoft System? The Aquasana SimplySoft Salt-Free Water Softener beads are good for 50,000 gallons or 6 months time span. The system requires the purchase of replacement cartridges twice a year to work at optimal performance. Q. Is the simply soft better for the environment?